Milkshake connoisseurs, it’s hard to go wrong with the deliciousness of ice cream mixed with milk in any season, but now is the ideal time to get the last of your ice-creamy kicks in before the cold weather starts breezing through. Below are the best milkshakes our borough has to meet your milkshake needs. This kid-friendly scoop shop specializes in small-batch ice creams made from a variety of ever-changing local, organic ingredients. Their wacky flavors typically involve a thick, creamy base with chunks of crunchy, cakey, and/or gooey mix-ins. When whipped together with Batenkill Valley whole milk, any flavor milkshake you choose will be delicious. Give their award-winning salted crack caramel a try if you’re in the mood for a smoky, rich and decadent shake. Another classic, Ooey Gooey, offers chunks of butter cake swirled into a creamy vanilla. If you’re feeling indecisive, opt for The Munchies with a mix of pretzels, Ritz crackers, potato chips, and mini M&Ms in vanilla ice cream. You can even get creative and mix flavors, like chocolate and Fluff and Stuff, a peanut butter ice cream with marshmallows and peanut butter cookie crumbles. Seasonally, they operate at Pier 5 at Brooklyn Bridge Park in Brooklyn Heights. This laid-back yet lively family-owned Venezuelan restaurant serves amazingly fresh and affordable arepas and the best coconut milkshake you will ever taste. This creamy specialty shake is served in a simple mason jar topped with cinnamon and a maraschino cherry. Made with organic, pasture-raised, all-natural Blue Marble ice cream and topped with sweet, gooey caramel sauce, the Bananas Foster Milkshake is a thing of beauty. Enjoy it with a side of sweet potato fries or onion rings and an organic, grass-fed beef burger. 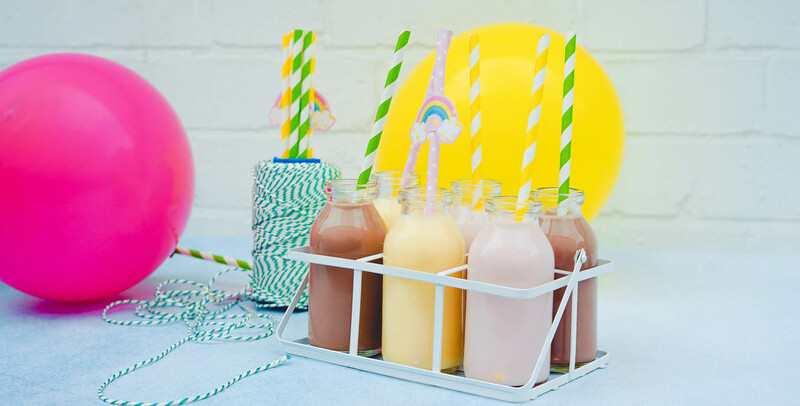 You can also request off-menu milkshake options like PB&J, which includes generous heaps of organic peanut butter and an ample swirl of sweet jam. Toeing the line between fast food and fancy, this simple and affordable counter-order joint is often compared to Shake Shack, but without the long lines. Their hand-spun cookies and cream shake is thick, creamy, and highly slurpable. At this hip, high-tech bowling alley, the Blomberg brothers of Blue Ribbon fame conceived of a thick and boozy Bourbon Street Shake, made with Nutella. This compelling concoction reminds you of your childhood coupled with adulthood and a pinch of New Orleans naughtiness. 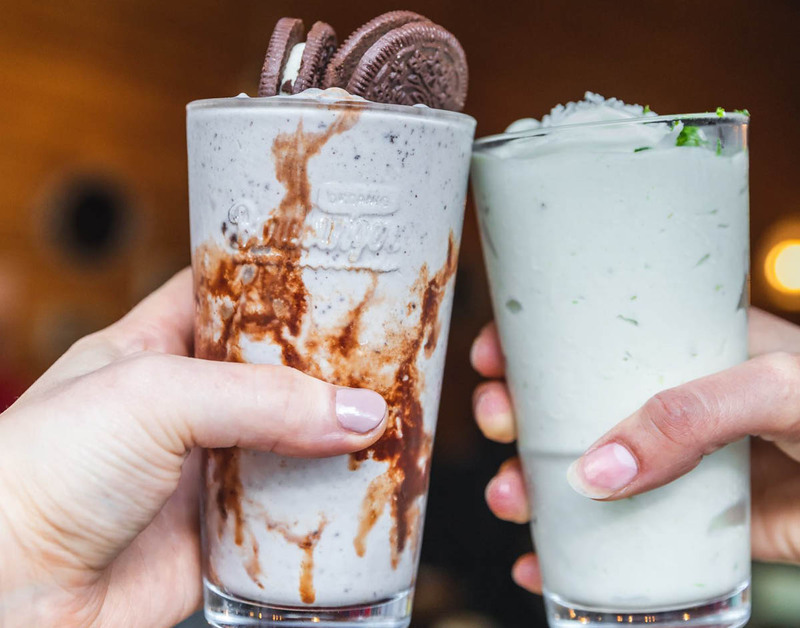 Housed in a fully restored 1920s apothecary in Carroll Gardens, step back in time while enjoying old-time classics; among them the best Black and White milkshake the city has to offer. Fresh, locally sourced vanilla ice cream from Adirondack Creamery is the base for their hand-churned creations. For the Black and White, a tall glass is swirled with thick homemade hot fudge and a vanilla shake is poured inside, topped with freshly-made whipped cream and an all-natural maraschino cherry. You can request any type of shake you can dream up, and they will do their best to make it happen—even if that means heading to a nearby bodega for the ingredients. Most of their flavored syrups are homemade. You can also try blending in their house-made honey-flavored peanut butter. This clever craft cocktail bar and bakery makes an unbelievably tasty boozy shake. Try the Nameshake with Blue Marble vanilla ice cream, butterscotch caramel, and Monkey Shoulder scotch, topped with whipped cream, or sip a Pretty in Pink with Aperol, rosé wine, and seltzer, blended with strawberry ice cream. You could also opt for a pie shake with flavorful chunks of pie blended with a selection of ice cream flavors. Try the bourbon ginger pecan pie with an all-butter crust, organic Texan pecans, Kentucky bourbon, and lots of ginger with vanilla ice cream, or S’mores with a house-made graham crust, milk chocolate custard, and freshly-toasted marshmallow. This quaint and cozy neighborhood diner hits the spot when you’re in search of an affordable, classic creamy chocolate or vanilla milkshake. The owner Steve knows the regulars by name and the food is reliably good. This neighborhood standby consistently serves up a deliciously thick and tasty classic chocolate, vanilla, or half and half (a swirled mix of chocolate and vanilla). You might also want a side of their beloved Dumac & Cheese or a buttery burger on a brioche bun to complement your shake. Head here for the Wake Up Shake with a coffee ice cream base, Kahlua and Bailey’s Irish Cream, or a Bourbon Spiked Shake with house-made bourbon. You can also stick to booze-free options like Nutella & Banana, Toasted Marshmallow, or a dairy-free oat milk shake. 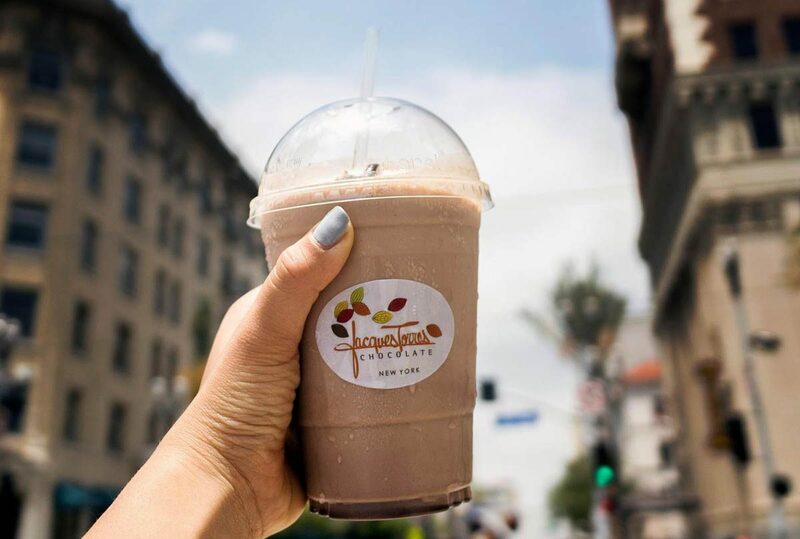 If you want a shake with a kick, try the Wicked Spicy Frozen Hot Chocolate made with 60% dark chocolate and a secret blend of spices that include chipotle chili peppers and ground ancho for a refreshing treat. You can also opt for a shake made with any of their premium ice creams and pair it with their delicious chocolate chip cookies. This popular hotspot combines its famous soft serve ice cream with organic milk in novelty flavors (booze optional) for creamy, delicious, melt-in-your-mouth goodness. 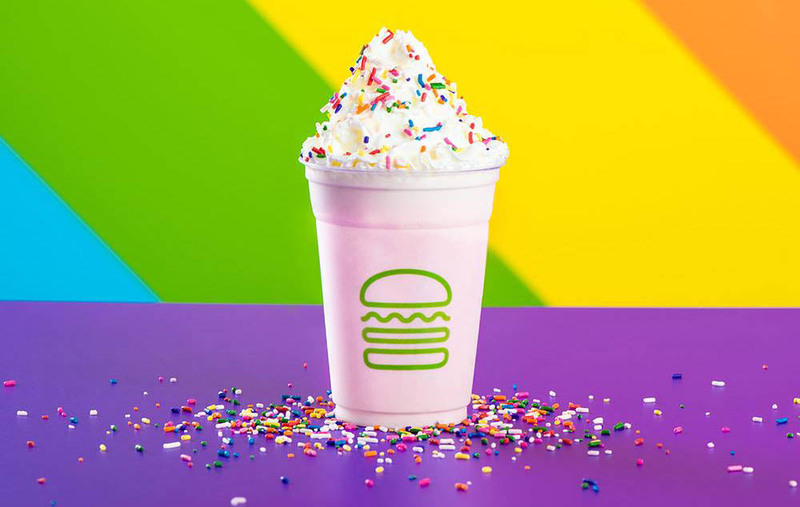 Specialty flavors include mix-ins like fruity cereal milk and white rum for the Fruit Cereal Milk Shake, tequila and lemon honey syrup for the Yuzu Cherryrita, simple syrup, Frangelico, and Crack Pie soft serve for the Nut Crack’r, and B’Day Cake Truffles blended with Cereal Milk soft serve for the Birthday Cake Shake. This offbeat ice cream shop was founded by James Beard nominated pastry chef Sam Mason of WD~50 fame. Milkshakes are whipped up with locally-sourced milk from Battenkill Valley Creamery combined with any of their rotating small-batch unique flavors. Coffee lovers, try the cold brew milkshake with Stumptown coffee on draft. For adventurers, try a more unique offering: toast and chorizo caramel swirl, tobacco leaf-smoked chili huckleberry, burnt marshmallow, saffon passion fruit, miso cherry, banana pudding, pretzel, and more. We feel partial to the hand-spun salted caramel milkshake, thick and rich with frothy lumps of frozen custard. Every sip is transporting. Known for their use of specialty ingredients, their ice cream is made locally from scratch in Greenpoint, with simple, all-natural ingredients: fresh milk and cream, cane sugar, and egg yolks. Vegan varieties are crafted with cashew milk, organic coconut milk, organic extra virgin olive oil, organic cane sugar, pure cocoa butter, and organic carob bean. Their shakes are creamy, decadent perfection.